Werner Heisenberg was a prodigal child. From 1920 to 1923 he studied Physics and mathematics in München and Göttingen. In Göttingen Max Born and James Franck were his physics teachers and David Hilbert taught him maths. In 1922 he met Bohr and this meeting was important for his futher career. From 1924 to 1927 he worked as a private teacher in Göttingen. In 1926 he became assistant to Bohr in Copenhagen and there he developed his uncertainty principle. In 1927 he became a professor in Leipzig where he worked on quantum theory with Wolfgang Pauli. In 1932 he published his first paper on the neutron-proton mode of the nucleus. During the same year he received the Nobel Prize, aged only 30. After 1933 he came under fire of the pro nazi deutsche Physik movement, that attacked several leading scientists. In 1936 an article against him appeared in a nazi newspaper and in 1937 he was attacked in a publication of the SS. This resulted in the Heinsenberg Affair. Himmler decided that Germany needed him and the three investigators that were appointed by the SS all took his side in his academical dispute with the deutsche Physik. In 1937 he married Elisabeth Schumacher. In 1938 they had twins and five more children followed. In 1939 he was involved in the German nuclear enery project. Later he stated that due to a 'lucky coincidence' nothing came of the attempts to create an atom bomb. During that same year he travelled to the USA, but he refused to become an American citizen. In September 1942 he visited Bohr with whom he discussed nuclear research. In 1944 he visited Copenhagen again and he lectured in Switzerland. In 1945 he was arrested and brought to England, together with other scientists who had worked on the nuclear energy project. In 1946 he was returned to Germany, where he became director of the Kaiser-Wilhelm Institut für Physik in Göttingen. In 1958 it was relocated to Munich and renamed to Max-Planck Institut für Physik. Heisenberg again became its director from 1960 to 1970. 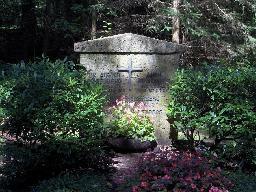 The grave of August and Werner Heisenberg at the Waldfriedhof, München.